Your little one made their debut. You’ve made it home. Now what. The birth of my third son was about as perfect as it could have been. Every prayer and every request I made of our awesome God was granted, above and beyond what I could have thought possible. I was on a high those days in the hospital, and so completely excited to come home after a two night stay, without any complications. But once I got home, I felt my body’s recovery settling in. I felt my body shifting, things settling and just feeling like I had a ways to go to get back to some kind of normalcy… and when one of my dear friends texted me to see how I was doing, I basically told her, “I’m good, but recovery is definitely setting in…and it’s a little worrisome for me because I always feel like something I’m not expecting might happen that I have to deal with or heal from.” Both of my previous recoveries were extremely difficult and long, one requiring me to return to the hospital and then again to the ER, so needless to say I was paranoid. She sent me a link that day, (she writes articles for a mother’s magazine), of an article she wrote about her postpartum days after her third child. And while I am not as eloquent or as wise as her, her article spoke to me and made me want to write down my own thoughts and feelings about this time period. Mostly for myself, because I know my thoughts and memories will fade, and I want to be able to come back to a space and remember this time, but also for other women facing their own recovery time period. Recovery after having my boys has notoriously been hard for me. Partially because of the complications from my births, but also because I just pushed it and did too much too soon. I didn’t realize how important it was to just rest and take things slow. 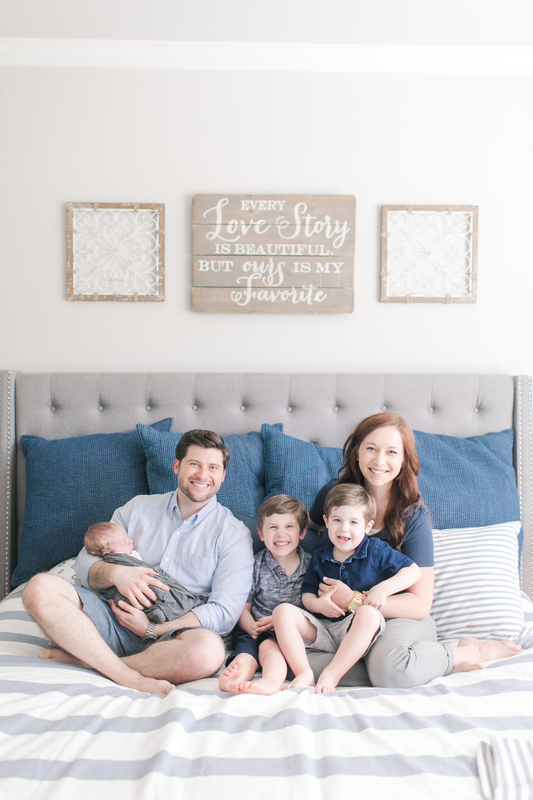 I had never even heard of the concept of “lying-in” until after I had my second son, but looked into what it meant after a friend of mine spent a lot of time being very intentional about her time after her second son’s birth. It seems like a lot of American women are focused on “bouncing back” as soon as possible, acting almost as if a huge dramatic event of life on their body didn’t just take place. Once I realized that other countries take weeks and sometimes months to allow their bodies to heal and to give the mother time to bond with her baby (see this article for more! It’s so good! ), I knew this was something I needed to prioritize after this third birth, no matter how well it went for me. Personally, this was something I planned for. I knew my husband would have some days off, but I also asked my mom to come and stay with us the first week, and then asked my mother in law to come stay with us the second week. They both graciously said yes and were happy to come and help, even though it meant time away from their own lives and dealing with cleaning my house, cooking meals for us and wrangling our two other monkeys. It is a tall order for sure, but they both were wonderful with our kids and allowed me time to heal, to process everything I went through (because even though I had no complications, it was crazy intense what I went through to get that little guy here! ), and to spend as much time as I could getting to know my little one and working on our nursing relationship. Honestly, this time “lying-in” was a little hard for me… mainly because I am very independent and do not like people waiting on me. It was strange for me to have people bringing me food, cleaning my house and taking care of my kids when physically I knew I could stand up and walk to the kitchen and get my meals. I had to fight my head telling me to “get up and go” so that my body could really recover. A friend of mine told me “at least five days in your bed and five days around your bed… and then sit as much as you can after that”… and I will say that taking this time was definitely what my body needed. My recovery has been so much better this time around…yes, partially from my birth being better but also because I listened to what my body needed and took things slow. There is a ton of information on “lying-in” online and how you can do it. There is no specific set way, no specific time required other than do what your body needs you to do and what your help can allow you to spend. Some countries do have parameters or a set way of doing it, but I think the concept of just taking time to rest and be with your baby is the focus. Spend time resting in your bed, around your bed… let people and your family come to you…rest, hydrate and eat, and snuggle that sweet new baby. There are some things I just wanted to remember for myself and also just some things you may want to consider for yourself during this time… it goes by SO fast, just as everyone says, and my memories fade so quickly, probably from lack of sleep and just the constant demands of life. So I wanted to take this space to record some of them here, so I can come back and remember one of the sweetest and most innocent times of my life. I think of that feeling of just looking at him and his size, how he was curled up inside of my tummy for all of those months, and how easily his tiny body molds back into that shape. His little frog legs easily squish back up underneath him and he fits perfectly on my chest with his arms tucked underneath. I’ve spent so much time just staring at his features, his tiny perfect hands and long fingers, his tiny tiny feet… his perfectly molded ears, all of the features of his face and the beautiful full head of hair that I asked God to give him. It seems that his look changes daily and I cannot drink it in enough. I feel like this is exactly how he was sitting inside my tummy for so long, he has his little legs crossed all the time! It’s been incredible watching my tummy go down each day. I’m not to my pre-pregnancy weight or size by any means, but from the time I had Jenson to a week later, my stomach went down immensely. It’s amazing to me that God created aspects of nursing to help your uterus contract down in size and get back to where it was before. I’ve loved seeing our nursing relationship improve each day. Spending time holding your baby and looking at him, being near him creates the opportunity to see nursing cues quickly and identify their way of doing things. Yes, those cues are universal but every baby is different, they latch differently, cry differently and need you differently. Each day I have worked and worked to get him to nurse more efficiently, and while painful at first, it has slowly subsided and gotten better. I did have days that I felt strangely anxious… I was very conscientious of where my baby was and there were times it was physically stressful for someone besides me to have him. I didn’t really feel this way as much with my first two, so I don’t know if it is because he is my last or because of the intensity of our birth, and I just felt more possessive of him because I worked so hard to get him out. I knew it didn’t make sense because everyone around me was trustworthy, but I felt like it was worth noting. I think if you are feeling anxious at all, just take some time to hold your sweet little one and take some deep breaths, because it seems like it immediately calms you. One of the hardest part to me with recovery is the immediate change felt in your family unit. It is always so hard for older children to accept a new little one, especially if they were previously the baby. I cried many days that first week because of the way my now middle child (previously the youngest) was trying to make sense of things and deal with his disappointment and confusion. Our routine changed drastically and quickly, mommy couldn’t pick him up instantly at times and wasn’t able to do a lot of the things I normally did for him. It truly feels like they age years over night. My friend advised me to let my children come to me. Take things slowly, and let them come into your space to spend time with you. It was so hard to watch them find their new roles, but this was so wise of her to mention to me, and slowly but surely, they found their way to me and relaxed, and spent time getting to know their new little sibling in a safe place. I met them where they were emotionally, tried to be patient with their responses and reassure them that I still loved them and everything was ok. We looked at old baby pictures of them and talked about how I used to nurse them and hold them just like I was doing for their new brother. And with time, things got better and sweeter. My oldest son has been SO proud of his new little brother. He has gone above and beyond trying to help with him. This was the first time Jude held Jenson. It took him a little while to come around but he finally said he wanted to. I’m pretty sure my eyes teared up a little, especially because of how hard of a time he was having those first few days of being home. These weeks were absolutely some of the most precious of my life, that I will cherish forever. “Babies don’t keep” as they say, and will be so glad and grateful that I was able to take so much time for myself and for him at the beginning of our relationship.